It might seem like a smart idea to swap your sugary soda with diet soda, but new research further confirms this may not be as safe or smart as you might think. Most of us try to make low or no sugar swaps to improve our health, and even lose a few pounds. But things aren’t always as they seem. If you’ve ever replaced real sugar with artificial sugar, you probably noticed you often continue to crave something sweet. What gives?! Often, it’s not what you’re doing but what we’re NOT told about these fake foods (even the ones marketed to us as a healthy choice) I was there myself…big time! We’ve known for years that sugar isn’t good for our health. Research on the impact of sugar on heart disease and cancers dates back decades. Unfortunately, many people swore off sugar and replaced their favorite beverages and treats with artificially sweetened versions of the same junk in the name of health. Diet soda junkies slurped down gallons per week (feeling it was the superior choice, I might add) of the stuff marketed as healthier, and calorie-free. Not only are these artificial substitutes unhealthy, they’re also addictive hormone disrupters. So if diet soda isn’t the right solution and sugary sodas aren’t the answer, what about fruit juices? The fact is most fruit juices are just as high or higher in sugar than soda. Now it’s true that fructose and glucose don’t seem to have the same damaging disease implications, but when it comes to insulin – sugar is sugar. That’s right. While soda gets a bad wrap, people forget about all of the other sneaky ways sugar creeps into our diet. Let’s break down the numbers: a 12-ounce can of Coke contains 30 grams of sugar. And let’s be real, most people are drinking more than a can a day. 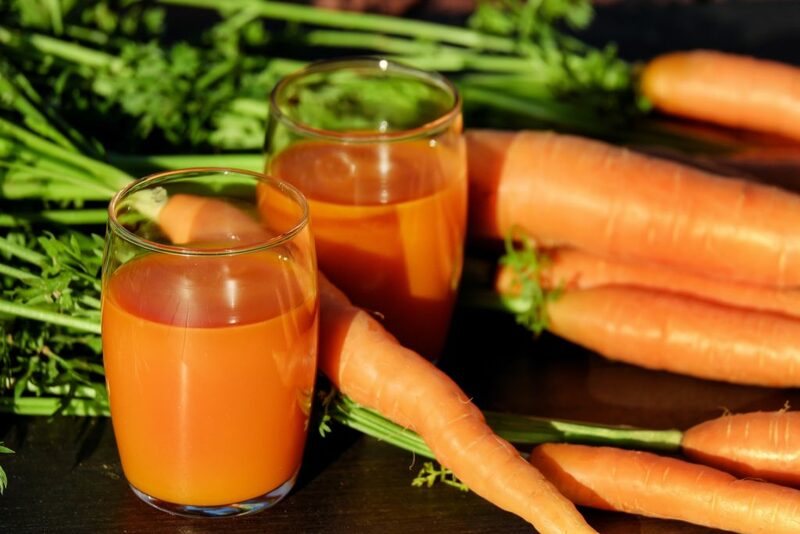 How about juicing? A 12-ounce juice contains about the same amount of sugar as a can of Coke. And again, most people are walking around with at least a 24-ounce cup! Yes, it’s “natural” sugar from fruits and vegetables, but your body doesn’t care! Your body just identifies it as sugar. Yes, you’re getting nutrients but it’s still coming with a big sugar dump and without the fiber contained in whole fruits and vegetables. And remember, that fiber helps stabilize blood sugar levels (which is why I personally am not a big fan of juicing). But if it’s working for you – that’s all that matters! But is it truly working for you? By consuming more sugar than we need, it deregulates the insulin response. In other words, it disrupts our body’s ability to know what to do with insulin. And then what? Weight gain and laundry list of increase of disease risk factors. The body fights this increased insulin issues by generating an inflammatory response as a protective mechanism. Inflammation sets the stage for plaque formation, leaky gut, hormone disruption, and weight gain (especially around the midsection)! “Consumption of added sugar is associated with development and/or prevalence of fatty liver, dyslipidemia, insulin resistance, hyperuricemia, cardiovascular disease, and type 2 diabetes, often independent of body weight gain or total energy intake” (1). Research supports the connection between consuming excess sugar and the development of chronic diseases and metabolic conditions, regardless of the individual’s weight and or how many calories they’re consuming (1). Oh man! I have opened up about my full-blown, junkie level, 30 year-addiction to diet soda. By cutting out high-fructose corn syrup and refined carbs, I thought I was living a low-sugar life. What I didn’t consider were the other forms of sugar in my diet, and my addictive reliance on the unhealthy chemicals found in my diet soda. My low fat obsession had me fueling on what I believed were healthy breads, brown rice, grains, and massive amounts of fruits and vegetables. To top it all off, I washed it down with enormous-gulp-sized drive-through window Diet Cokes – all day. Sometimes, I’d drive through two or three times a day to get my fix. I was in denial that a sugar-free beverage (something I craved and couldn’t start my day without) might have any negative side effects. Queue up my health scare which brought everything to a screeching halt and sparked a major evaluation of the research surrounding artificial sweeteners and health. I learned about how the brain responds to different foods and dietary habits. People who admit to being “sugar addicts” have the equivalent of a substance abuse dependence. Sugar is more addictive than heroin, so it makes sense that people are literally addicted (1). So repeat after me – it is not you! It is not lack of willpower or another failed attempt at cutting out sugar. You need to know this as you begin to wean your body off of not just sugary beverages, but artificially sweetened beverages. This might be one of the hardest things you’ve ever done! So, if doing it in baby steps gets the ball rolling, so be it. Gradually cutting back is better than not trying at all. Before you swear off every morsel of sugar for life, pause and be realistic. It’s not that sugar or carbohydrates are bad. Rather, it’s our excessive consumption of them, which results in damaging disease-inducing risk factors. The total amount of sugar consumed is what matters! Cancer research links high added sugar intake to increased cancer risk. Period. In an evaluation of 15 studies specific to sugary foods and beverages, a 23-200% higher cancer risk was observed with higher sugary beverage consumption (2). Think beyond the brownies and cookies and evaluate the amount of sugar coming from beverages. How does diet soda maintain its sweetness? Artificial sweeteners. And how can something that’s zero calories and zero sugar be bad for you? Well, we know the more sweets we consume, the more sweets we crave. The same goes for artificial sweeteners, they’re still activating a part of our brain that thinks we have consumed regular sugar. Therefore, it still activates sugar cravings! The more sugar we take in (or that our brain perceives we’re taking in), the more we crave it. Aside from the increased cravings, research on artificial sweeteners points to long term impacts. 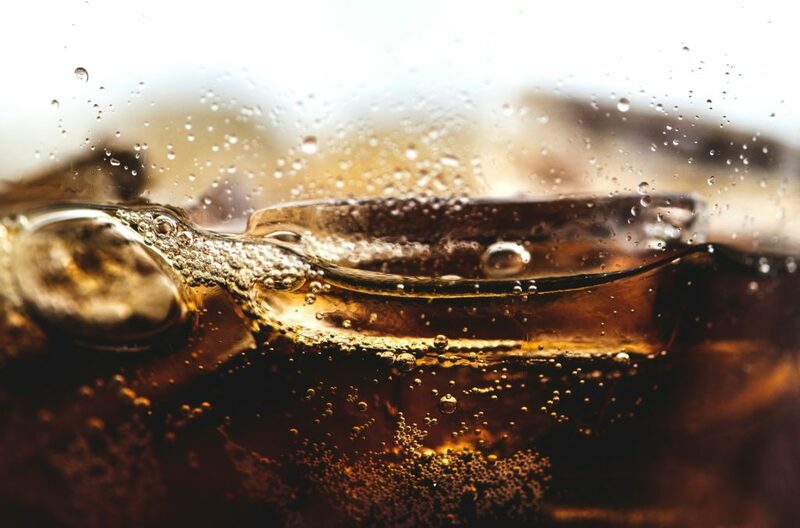 As part of a Women’s Health Initiative, an article was released in February of 2019 discussing the links between artificially sweetened beverages and stroke, coronary heart disease, and all-cause mortality (3). The report states that high consumption of artificially sweetened beverages had a clear association with an increased risk of stroke (certain types), coronary heart disease, and all-cause mortality. “High intake” was defined as two or more artificially sweetened beverages per day. And just like the sugar studies, the higher the intake of artificial sweeteners, the higher the risk. Not only did the study include Diet Coke, it also included diet fruit juices. But what about type 2 diabetes? Sugary beverages have been associated with an increased risk of diabetes for some time now. But, if diet beverages use artificial sweeteners, is it the same association? According to this study, yes. The results showed that artificially sweetened beverages were associated with a 21% increased risk of developing diabetes (4). In addition, there was also a significant dose-response relation. Meaning, the higher the consumption, the greater the risk. March of 2019 Harvard research is the latest information blowing up the internet in the health space. Researchers set out to investigate the connection between sugary and artificially sweetened beverages and risk of death (5). Results showed that with frequent consumption of sugary beverages (2 or more per day) there was a higher chance of death, compared to those who consumed less than one per month. Each additional serving per day was associated with a 7% higher risk (5). They even broke it down into cardiovascular disease mortality and cancer mortality, showing that the higher the intake, the higher the risk percentage increased. Similar results were found when investigating artificially sweetened beverages. Consumption of artificial sweeteners was associated with higher total death rates and cardiovascular disease death in the highest intake category only (5). Again, the more frequent and the higher the consumption of artificial sweeteners, the greater the risks increase. The Harvard study estimated that replacing one serving a day of sugary beverages with artificial sweeteners decreased the risk for total mortality by 4% (5). And another study showed that substituting one serving of an artificial sweetened beverage with water resulted in a 5% risk reduction of diabetes development (4). Whether you’re a casual soda drinker, or a full-blown junkie, we’re all about providing the most up-to-date information to help you make informed choices. The point is, even small reductions in consumption make a positive difference. Trust me, it was a process for me too! I weaned off slowly. It made me grumpy. I craved that bubbly zing every day. But my deteriorating brain-health and physical health became my “why.” I made it my mission to break the addiction, and did so by going from four to six Diet Cokes a day, to just a couple. I stupidly thought Diet Sprite would be better, since it was clear, and relied on that for a while, until I created my favorite alternative: Lemon Ginger Water (grab my recipe here). Now I drink my little recipe and cold, clean water all day, every day. I am proud to say, I actually CRAVE plain water now! I promise you, if I can break the habit, so can you! Stanhope, K. “Sugar Consumption, Metabolic Disease and Obesity: the State of Controversy.” Critical Reviews in Clinical Laboratory Sciences 53.1 (2016). PubMed Central. Web. 19 March 2019. Makarem, N. “Consumption of Sugars, Sugary Foods, and Sugary Beverages in Relation to Cancer Risk: a Systemic Review of Longitudinal Studies.” Annual Review of Nutrition 38 (2018): 17-39. Web. 19 March 2019. Mossavar-Rahmani, Y. 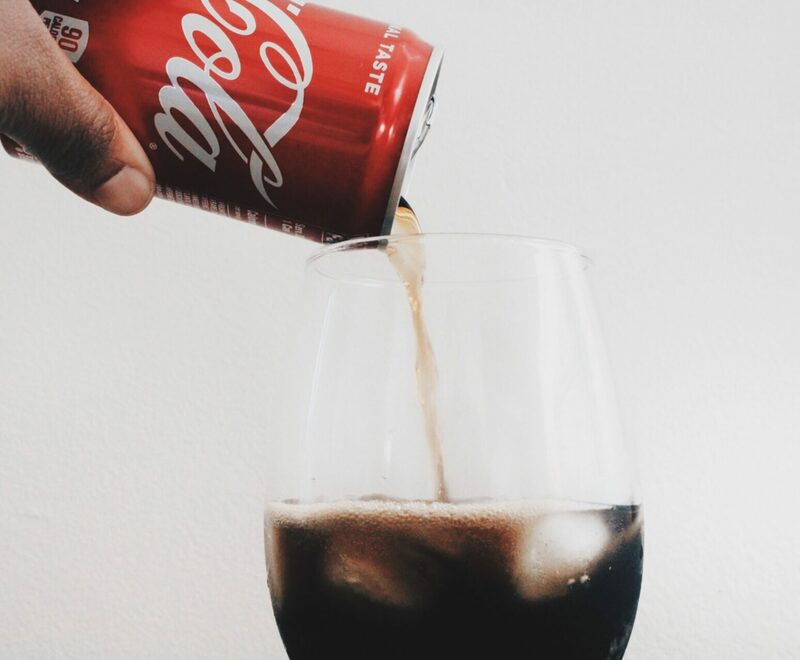 “Artificially Sweetened Beverages and Stroke, Coronary Heart Disease, and All-Cause Mortality in the Women’s Health Initiative.” American Heart Association 50 (2019): 555-562. Web. 19 March 2019. Huang, M. “Artificially Sweetened Beverages, Sugar-Sweetened Beverages, Plain Water, and Incident Diabetes Mellitus in Postmenopausal Women: the Prospective Women’s Health Initiative Observational Study.” The American Journal of Clinical Nutrition 106:2 (2017): 614-622. PubMed Central. Web. 19 March 2019. Malik, V. “Long-Term Consumption of Sugar-Sweetened and Artificially Sweetened Beverages and Risk of Mortality in US Adults.” American Heart Association 139 (2019). Web. 21 March 2019.